Despite a cold February, unemployment rate surprised on the downside and declined to 3.7%. 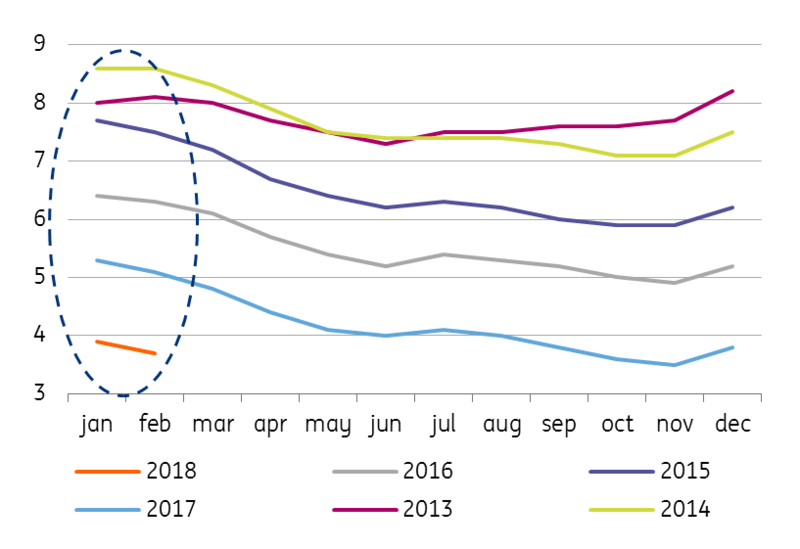 Date published by the Ministry of Labour shows February's share of the unemployed people declined from 3.9% in January to 3.7%. As such, the labour market again beat market estimates, which expected a decline to only 3.8%. This is in spite of the fact that February was on average the coldest month in the last six years and low temperatures complicated the beginning of some works for example construction. The demand for employees increased further in February as job vacancies rose again to a new record-high level of 239 000. The highest share of vacancies (over 23%) is reported in the manufacturing industry. In the YoY comparison, 96 000 more jobs were created (67% increase), and the number of unemployed people declined by 100 000 (36% decline). Thus, the number of job seekers per one job reached 1.17, which is also the lowest share in history. All in all, the current development of the labour market are still favourable which reflects the overall growth of the domestic economy. If we look at the labour market with different optics combining the number of unemployed, the number of vacancies and the total number of employed people, we always get to levels significantly above the pre-crisis peak in the first half of 2008. This is also seen in the EU-harmonised definition of the unemployment rate, where the Czech economy with a 2.4% unemployment rate below all EU countries. The Czech National Bank's recent forecast expects the share of the unemployed to decline to 3.4% while the Ministry of Finance forecasts for 3.3% in 2018 (vs 4.2 in 2017). This means that the number of unemployed people will fall to at least 240 000 this year, while job vacancies are likely to reach at least 265 000. Interestingly, we expect the economy to reach a situation where job vacancies will exceed the number of job seekers this year, which means that an overheated labour market will be the main pro-inflationary driver this year.